Imagine exchanging your vows in a lush, romantic garden framed by flowers and with the backdrop of warm Pacific waves sparkling in the light of a red-gold sun behind you. 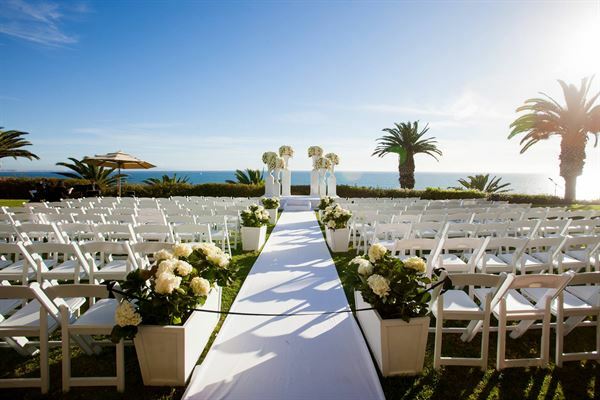 This is the experience of the Bel-Air Bay Club, an exclusive Malibu wedding venue with a beautiful ocean view and private estate on the bluffs overlooking Los Angeles bay where all your wedding dreams will come true. Bel-Air Bay Club is yours exclusively for your reserved timeframe. The Bel Air Bay Club has been hosting events in the Los Angeles area since the 1920's. Recently, I had the pleasure of attending a conference there connected to my work in publishing. The site is really two locations separated by the Pacific Coast Highway. Both are just gorgeous. The lower clubhouse is on the beach, and the upper one is nestled against the hillside. The site has several rooms and so can accomodate groups of varyiing size. We were in what's known as the Board Room which easily contained the hundred or so of us present. It had great views of both the ocean and the verdant hillsides. There are smaller and larger rooms as well. There is also a large lawn area that is used for receptions and the like. Staff is available to help in planning for events. All the employees that we met were very helpful and professional. They have a catering service that is capable of handling the most discriminating of tastes. The meal we were served featured fresh fish from the local waters. We were all impressed with the quality of the food and the service. The setting simply can not be beat. Not only is it one of the most beautiful spots in Los Angeles, it is also convenient to the air5port, Hollywood, and downtown. I visited here with my company a few years ago for a meeting and absolutely loved the location. Needless to say I was not very focused on what was going on in the meeting, because I could not stop staring at the view. The view is amazing, the food is great and associates are wonderful. I can not really comment on the price because I do not know how much the company I work for paid for it, so I'm going to say 3. Looking for a private location with style and privacy? You would like to impress your audience yet deliver a comfortable setting with a 180 degree view of the Pacific Ocean? If this sounds nice then the Bel Air Bay Club is the perfect location. With a fantastic and famous breakfast, lunch and dinner selection provided by the best Southern California chefs, this location is constantly rated as one of the top meeting locations. Bel-Air Bay Club was built during 1927 and 1928 as part of a 31-acre project conceived by Alphonzo Bell, one of the primary developers of Los Angeles. His previous real estate ventures included the Bel-Air neighborhood and its famous country club. Several years prior, Mr. Bell was also instrumental in the founding of the Hacienda Country Club. Mr. Bell was clearly key to the development of country clubs in the Los Angeles area. Bel-Air Bay Club consists of two facilities separated by Pacific Coast Highway. The grounds are located on one-quarter mile of beachfront, with a total of 14 acres including picturesque bluffs overlooking the sea. Mr. Bell situated the Upper Clubhouse in such a way that it offers an unsurpassed view of Santa Monica Bay and Catalina Island, with Pacific Coast Highway completely hidden from view by the landscape. Many visitors have commented that the Bel-Air Bay Club provides one of the finest views in the world. An extensive renovation of the Lower Club was completed in 2007. I recently hosted a conference at the Bel-Air Bay Club in Los Angeles. I have to say I was extremely satisfied with the event. In addition to the beautiful setting of the Dining room, the staff was friendly, courteous and extremely helpful. The dining room easily seated the 200 participants and allowed extra room to move around between lectures. Even though the room was beautiful, the best part was definitely the amenities offered by the Bel-air Club. The menu selection was extraordinary and the variety satisfied each one of the guests. The valet parking staff was fast, accurate and very friendly. Our attendant was courteous, helpful and extremely knowledgeable. I am extremely pleased with my experience at the Bel-Air Bay Club. Our wedding reception was held at Bel-Air Bay Club. The service was exceptional; everyone in our wedding party agreed that the friendly bay club staff went out of their way to make our day truly special. The lobster dinner served by the club's master chef was among the best I have ever tasted. I would recommend the Bel-Air Bay Club to anyone desiring a classy and elegant location for their wedding.